Through Blood and Fire at Gettysburg: My Experiences with the 20th Maine Regiment on Little Round Top by General Joshua Lawrence Chamberlain - Jimmie Aaron Kepler, Ed.D. “To the front for them lay death; to the rear what they would die to save.” These words describe the events that take place in this magnificent book of remembrances. In July 1863 around the Pennsylvania town of Gettysburg was staged the greatest conflict ever fought on American soil. There for three days the battle raged and brave men on both sides died. It was here the Confederacy reached its zenith. Following the battle of Gettysburg the Confederate States of America could only gather their broken forces and dread the certain end. The outcome of the battle was not decided until the third day and the disaster of Pickett’s charge where 6600 men had died. Each succeeding day’s battle had been more desperate than the one before. On the first day only a part of each army was engaged. July 2 witnessed the inferno of the Peach Orchard and the Round Tops. The last day was the most thrilling in our history. In this one battle was enough glory of heroism to immortalize the American soldier. “Through Blood and Fire at Gettysburg: My Experiences with the 20th Maine Regiment on Little Round Top” by General Joshua Lawrence Chamberlain deals with the Second day, when the slopes of the Round Tops were bathed in blood. The author, then colonel of the Twentieth Maine, was later given the Congressional Medal of Honor for his defense of these vital positions. It was the pivotal battle and point of the United States Civil War. 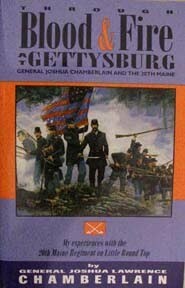 The little book is a must read for every person with interest in the battle of Gettysburg and the US Civil War. It is a primary source document that gives the story of the second day at Gettysburg from the Union point of view focusing on Little Round Top. The book reads both like an after action report and yet shows the scholarship of Chamberlain who was a Professor of Rhetoric at Bowdoin College in Bangor, Maine. Chamberlain was fluent in 9 languages (Greek, Latin, Spanish, German, French, Italian, Arabic, Hebrew, and Syriac), had a bachelor’s degree from Bowdoin College and a master’s degree from Bangor Theological Seminary. After the war he served as both president of Bowdoin College and four terms as governor of the state of Maine. The material in this book was originally published in “Maine: Her Place in History” (1877), originally prepared as an address at the Centennial Exposition at Philadelphia, Nov. 4, 1876, and was published in “The Passing of the Armies” (1915), a book of reminiscence dealing with the final campaigns of the Army of the Potomac all by Joshua Lawrence Chamberlain. Read and reviewed by Jimmie Aaron Kepler. Powered by WordPress.com. Jimmie Aaron Kepler, Ed.D.